If you want to go for the latest technology in your light bulb, opt for LED, which stands for “light emitting diode.” It used to be that these bulbs were only for specialty lamps, but nowadays these bulbs can fit into the standard screw-in connector featured in most lamps and light sockets. While the bulbs are longer-lasting and more energy efficient than your standard incandescent bulb, they focus their light in one direction as opposed to diffusing around a room. This makes them great for lighting up a specific space. They are ideal in reading lamps, under cabinet lighting, and as task lights. Plus, they don’t heat up as much as incandescent bulbs do during operation. The product is available in two different styles: soft light, which gives off a warmer and more cozy vibe that’s perfect for a relaxed mood (great for your living room and bedroom lamps), and daylight, which has the look of natural sunlight. This product is said to have a lifespan of 10+ years, and is estimated to save you about $60 in energy costs over those years compared to traditional incandescent lights. The majority of customers have been happy with the quality of the bulbs, especially with the reasonable price point, although some have reported issues with bulbs flickering over time. Here’s another 60 Watt bulb that has been getting great reviews from customers. This particular bulb is a great option if you’re looking for a quality LED bulb for your home. It can replace a standard 60-watt bulb and save you an average of $678 over the course of it’s life when you figure that the average lifespan of an LED bulb is more than 18 years and it only costs about a dollar per year to operate. Customers have been satisfied with its great amount of evenly distributed light as well as the longevity of the bulb. Some have said that the light is whiter than they would have liked, but if you’re looking for something that will produce a daylight effect, this is a good choice. One of the only other drawback is that it doesn’t work with your dimmer switch. Looking for an energy efficient light bulb that isn’t too expensive? 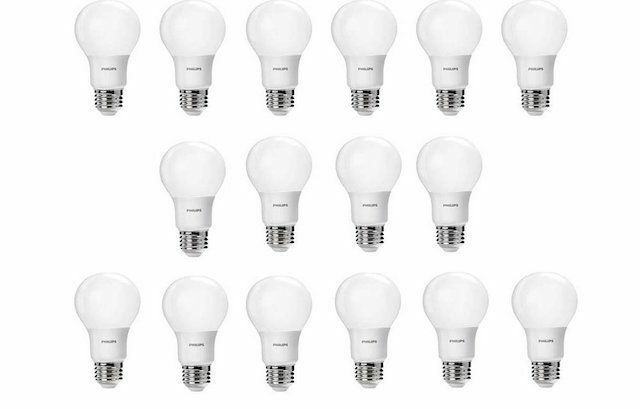 This one from Philips gives you good quality and longevity for less than $5 per bulb. The estimated yearly cost of running one is only a dollar, and it has an average lifespan of 10,000 hours. Just think of all the money you’ll save not having to buy so many replacement bulbs. Customers have been extremely satisfied with the price and the performance of this LED bulb. Many have said it gives a nice soft light, and it perfectly emulates an incandescent bulb. While some reviewers have complained about a slight buzzing noise when the light is turned on and the fact that it doesn’t last quite as long as more expensive LED bulbs, it gets the job done at a very reasonable price. For a handy, easy-to-install smart bulb that works with Alexa for voice control, look no further than the Philips Hue White A19 LED Smart Bulbs. With these dimmable bulbs, you can create a customizable lighting scene that can be controlled with a phone, switch, or tablet. Once you screw your bulbs into the light socket, connect them directly to your smart home device. They're 9.5 watts, or the incandescent equivalent of 120 watts. In addition to Alexa, these bulbs are also compatible with most other smart-home systems, including Google Assistant and Apple HomeKit. Just note that to get the full Hue experience, you’ll need to purchase the Philips Hue Bridge, which is sold separately. Since LED lights are more durable and use less energy than other bulbs, these make for wonderful bathroom lighting—and the AmazonBasics 75 Watt A19 LED Light Bulbs are a solid choice. In terms of durability, a single bulb has a lifespan of 15,000 hours (over 13 years), and it provides 1000 lumens of light, which creates a bright and inviting atmosphere. And you'll want that extra brightness when getting ready in the morning! This bulb won’t react to humidity and uses just 11.5 watts of energy, so it's an economical choice for a room that sees a lot of use. Also, for your peace of mind, this product is backed by an AmazonBasics limited three-year warranty. Want to take a look at some other options? See our guide to the best light bulbs for bathrooms. When it comes to kitchen lighting, you'll want to look for a light bulb with higher Kelvin so it will simulate daylight—and because we’re talking about the room that contains all the sharp knives, brightness and color temperature are crucial factors to consider. Enter the Cree 100W Equivalent Daylight (5000K) A21 Dimmable LED Light Bulb, which boasts a correlated color temperature of 5000 Kelvin, so you can clearly see everything that you're cutting. It will provide maximum visibility and make the other colors in your kitchen nice and vibrant. Expect a bright, white (almost blue-ish) glow. This indoor/outdoor bulb is also dimmable and designed to last around 22 years. If you're looking for a bulb that's specifically made for outdoor use, check out our favorite outdoor light bulbs. 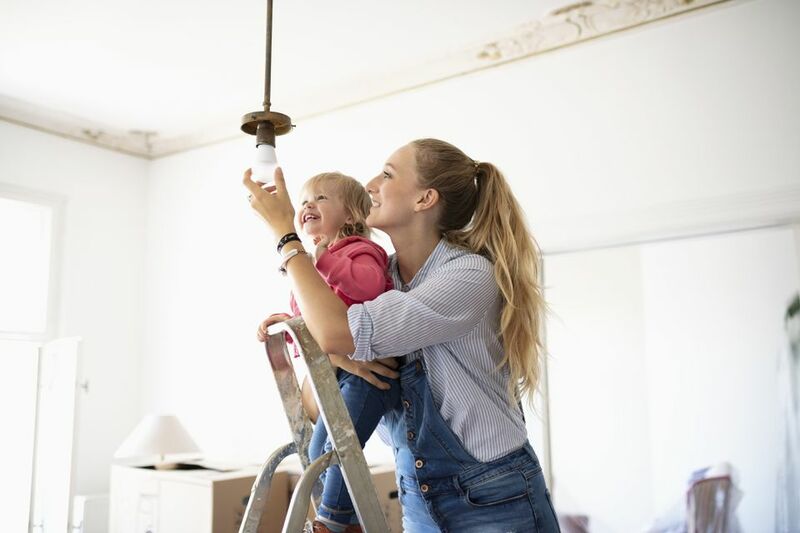 As you’ve read above, incandescent bulbs tend to use more energy and burn out more quickly, but many people prefer using them because they give the room a warm glow and can be complementary to skin tones. Because incandescent bulbs were what most people are familiar with, LED or CFL bulbs can seem harsh or stark by comparison. They also have some other added benefits—they can be used with a dimmer and are less expensive to purchase initially. If you prefer to use incandescent, this one from GE is a great option. It’s a 3-way light bulb with 50/100/150 watts and is rated to last for 1,500 hours. One customer who’s a decorator praised these bulbs for use with certain color schemes, saying it looks great in rooms with cool colors like blues and greens. Others have said it gives off good light in general and the bulbs stay fresh for several months after you buy them if you want to stock up. Some have had issues with the bulbs burning out sooner than desired, but the majority of users would recommend them. CFL stands for compact fluorescent bulbs, and they’re known for their energy efficiency and long-lasting power compared to incandescent. You can use them in place of incandescent bulbs and they’ll ultimately save you money since you won’t have to replace them as often. One thing to note about CFLs: to help them last longer, leave them on for at least 15 minutes or longer each time you turn them on. This will maximize the lifespan of the bulbs. This CFL bulb from GE is a best seller in its category and lasts as long as eight incandescent bulbs. It’s also Energy Star rated and doesn’t flicker when it turns on as many other CFL bulbs do. The majority of customers who have purchased this have been satisfied, with many praising the quality, longevity, and value of the bulb. Note that you shouldn’t use these with dimmers though. And like all CFL bulbs, these need to be properly recycled when they burn out. Contact your city or town’s waste management department for instructions. If you are a fan of the look that incandescents give off you might want to try halogen light bulbs that give off that warm, natural glow. This bulb works great for table, pendant or hanging fixtures with its 60-watt equivalent, it's also dimmable. Unlike CFLs and LEDs, this bulb won't give you a long life-span (1.8 years at 3 hours a day), though they provide more than an incandescent and use less energy. They give off a bright (but not blinding) light that makes them great for bedside reading. Vintage light bulbs seem to be all the rage these days. From trendy restaurants using them in breathtaking chandeliers to interior designers using them on scones, hanging pendants and more there isn't anywhere they can't be used these days. The problem with vintage bulbs is they are hard to find the right match for what you need them for. Our suggestions ​are once you find the right fit, buy a lot so you won't be left without light till your next trip to the store. This light bulb is actually an LED light so it will last a long time and it can also be dimmed. It gives off the 40-watt equivalent so you will need a few to light up your space. This bulb will last up to 15,000 hours so you won't have to worry about changing it out monthly. Reviewers note these are very cool looking and give off a nice soft light but they shouldn't be used for any type of task lighting.